One evening in early 2017 Louisa Maycock, Jake Cunningham and a few friends were discussing Mike Mills’ 20th Century Women. After coming home from the cinema, their housemate immediately went online and bought the classic pink and green Talking Heads: 77 t-shirt the character Jamie wears in the film. This got them thinking: “wouldn’t it be cool if women in film were treated like rock stars…if Greta Gerwig and Annette Bening had their names on t-shirts too?" The vision was a clean white tee with simple black type — pared-back & bold. Jean Seberg’s New York Herald Tribune t-shirt from Breathless and Katherine Hamnett’s slogan tees from the 1980s. The original run was for 30 t-shirts — printed in the back room of a local record shop. Enough for them, to give away to friends and a few to take to a screening run by Bechdel Test Fest. At the event they sold a couple but at the end of the event, they packed away their t-shirts into a suitcase and left feeling a little deflated. A day or so later a photo of a t-shirt popped up on Twitter and people started asking where they could get one. They set up an account on Etsy to see if the leftovers could find homes, miraculously they sold out and there was the demand for more. A couple of months later Tracy Letts wore our GRETA GERWIG t-shirt on the red carpet for the Lady Bird premiere at 2017’s Toronto International Film Festival and everything changed. Their t-shirts were stocked and sold out at this year’s TIFF. T-shirts have an incredible power to communicate a dialogue between their wearer and the rest of the world. This power lies in its simplicity – t-shirts leave space for the wearer to project their own meanings and start their own dialogues. Whether you love Greta Gerwig for Frances Ha or for appearing in the Russell Brand remake of Arthur, it’s up to you. First printed for their friends, Girls on Tops would never have predicted their t-shirts to spread as far and as wide as they have — but if Rooney Mara is seen wearing a Lynne Ramsay t-shirt and that means one more person curiously sits down to watch Morvern Callar, then they’re happy. Girls on Tops sell their t-shirts nationwide and have been worn by Lynne Ramsay, Greta Gerwig, Rooney Mara, Timothée Chalamet, Laura Dern, Annie Clark and more. 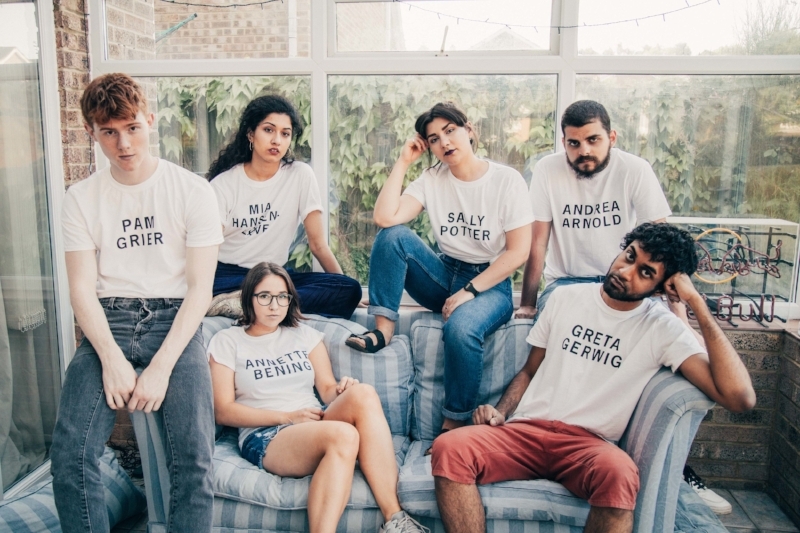 They have collaborated and partnered with Little White Lies , Barbican Centre , Peccadillo Pictures , Amazon Studios and put proceeds from t-shirts sales towards funding female-led film projects and commissioning female-led film writing.